The Stiga Allround Classic blade with flared (Legend) handle is assembled with Stiga Mendo Energy rubber with Max sponge thickness. THE BLADE: The Allround Classic is definitely a classic! A perfect balance between speed, weight, and feel lies behind the Allround Classic's enormous popularity among allround and novice players. THE RUBBER: The Stiga Mendo Energy has been developed in cooperation with world leading players to develop a power-soft rubber that creates maximum friction on the ball. OVERALL: This blade and rubber combination is ideal for all allround players, and it is especially recommended for those looking for their first competition paddle. I've been playing with this bat for about 4 months and I love it. It gives me complete control, great feel, outstanding spin, and all the speed I need when I want it. The thin 5 ply all wood construction lets you FEEL precisely what is happening to the ball on every shot. 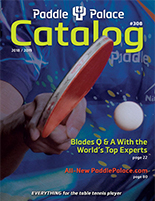 No wonder this bat is consistently the number one selling bat at Paddle Palace! This paddle is night and day compared to the one I got on Amazon that was around $40. Took a few games to get used to. It has excellent speed, control, and power. Love it! Because of this, my opponents are planning on upgrading theirs too after I've spanked them repeatedly. LOL! I bougth this paddle and rubers to give to my daugther´s first raquet. It is well assambled and perfectly finished. This product was delivered rigth on time. I wish that when I first started Table Tennis I bought this combination instead of those $20-$40 pre-made ones. To actually enjoy the game and establish good fundamentals, you need good equipment. I feel the Classic surprasses that minimum requirement by a fair margin without being too fast or hard too control. Even after one has establish good fundamentals, one can remain very competitive with this combo.